Project Sweet Talk is a sugaring unit that the sixth, seventh, and eighth grade students participate in here at Fairfield Center School. Each year the sixth-graders go out and interview local sugarers about history, marketing, tapping, gathering, and boiling. The seventh-graders learn about the maple tree, caring for the sugarbush, and the economics of sugaring. The eigth-graders do the tapping, gathering, and the boiling. Throughout, community members are called upon for their expertise! 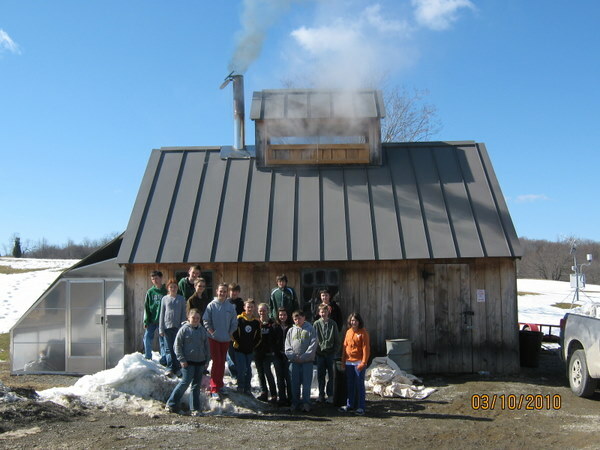 Below is a group of middle schoolers in front of our sugarhouse. The steam rising from the top is from the sap boiling inside.